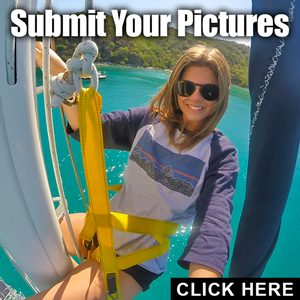 The BVI’s are back in business, and they are waiting for us cruiser’s to come back. 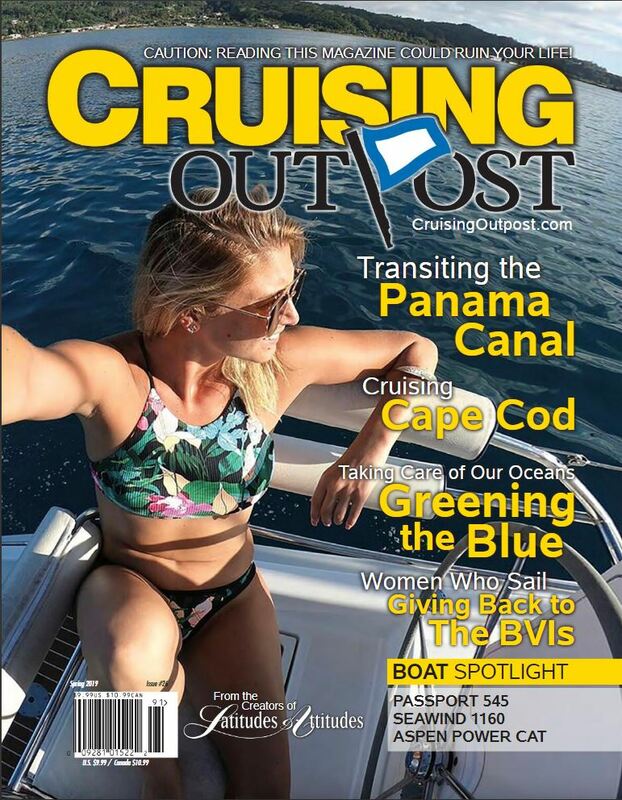 We at Cruising Outpost will be hosting a “Share The Sail” flotilla charter for those who want to join us, but there are also specials on bare-boat charters, special rates for resorts, rooms, meals and drinks. 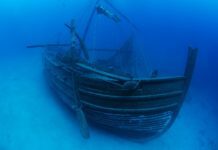 This Share The Sail will be leaving from the Dream Yacht Charter Basin on Tortola. We will be pleased to welcome you on arrival to Hodge’s Creek Marina. 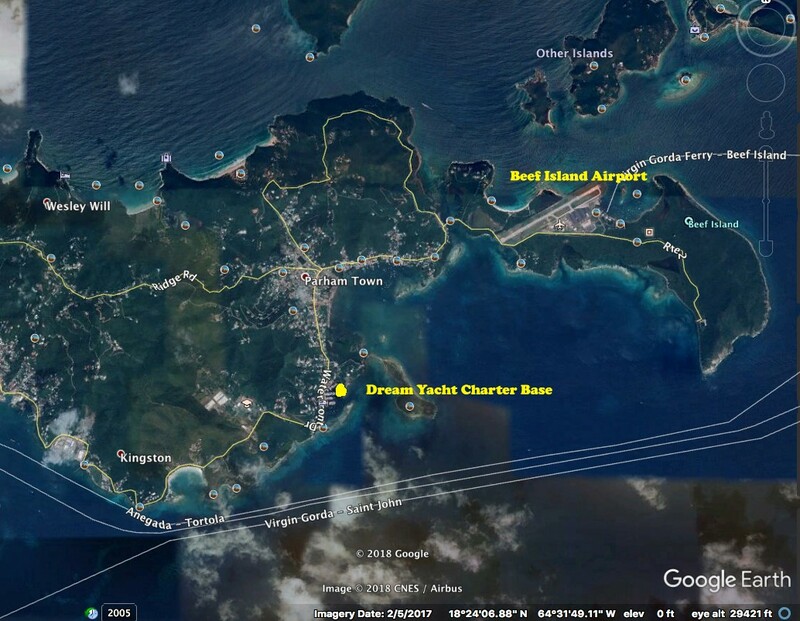 Fly direct to the BVIs via Beef Island Airport. 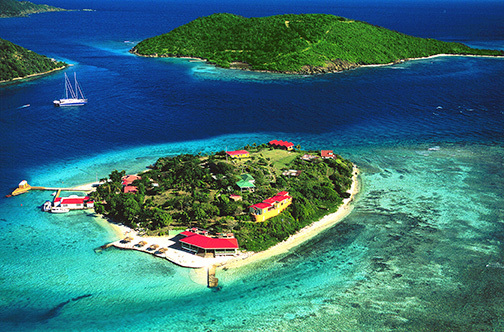 Or fly to St. Thomas in USVI and then take the ferry. We can arrange airport transfers on request and Beef Island Airport (EIS) is about 3.5km from our base. Make sure your passport is in date and valid for the duration of your stay. Canadians who fly into the USVI in St. Thomas may need a visa. Please check with your local authorities. Traveling around the island is easy, just wave down one of the many taxi mini-vans. The average fare is $1.50 but taxis do not have meters so haggle your price before you get in. If you rent a car, limousine, bicycle or motorbike, drive on the right-hand side and be aware the roads are in variable condition. The currency is US Dollars and Euros, travelers cheques, Visa and MasterCard are accepted, but American Express isn’t. ATMs are easily found in Tortola, look for Virgin Gorda First Bank, Banco Popular, Scotia Bank and First Caribbean Bank. Banks are open Monday to Thursday (8:30am to 3pm) and Friday (8:30am to 5pm). Tune in to the daily weather forecasts in English on CaribWx (ZBVI radio 780 AM). 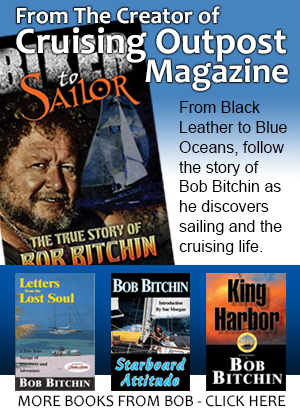 If you know of a business you visited while cruising in the BVI’s, and they are not here, email Bob! 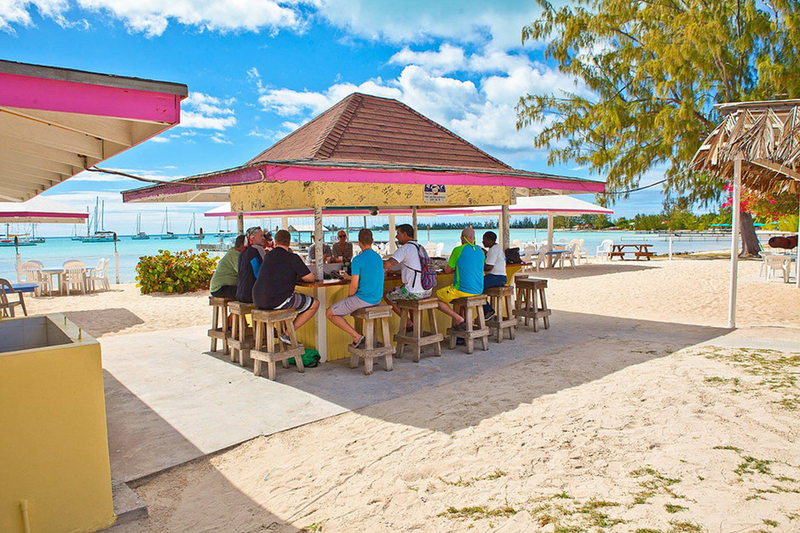 The Anegada Reef Bar is one of the best places to stop for a cold one while visiting the island. Stop by and see why! 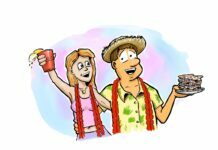 Cow Wreck Beach, which is our favorite in the islands, is open for all with their “honor bar and great burgers! 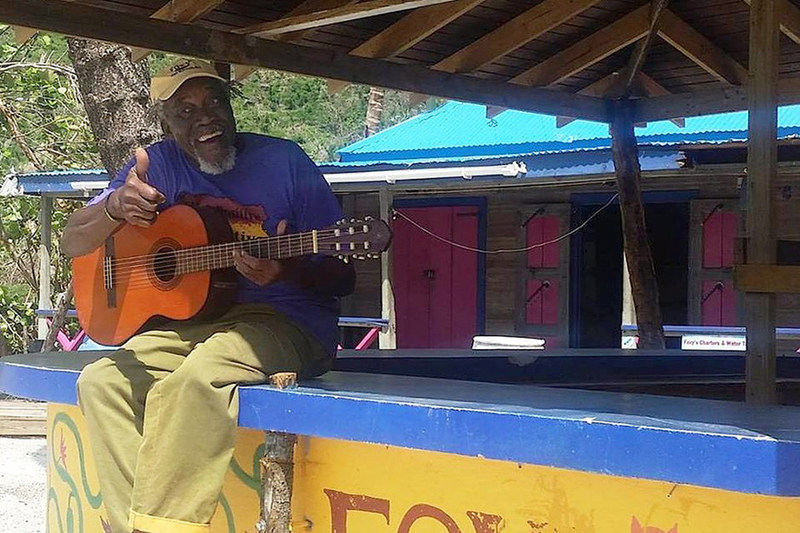 Foxy’s on Jost Van Dyke is open for rum, jokes by Foxy and shakin’ your thing on the dance floor. “Come one, come all. 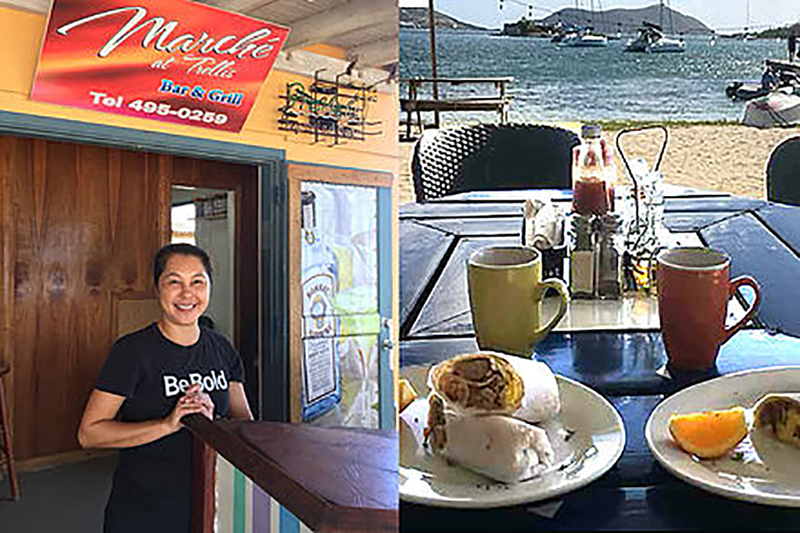 Marche´ Bar and Grill Trellis Bay has is a popular Beef Island spot and they’re back in business in Trellis Bay. Maria’s Hotel is the place most cruisers stay when awaiting their boat. Priced right and comfortable. Myett’s Cane Garden Bay Irma Edition. We’re open daily with great food, drinks and a beautiful view. Come join us. 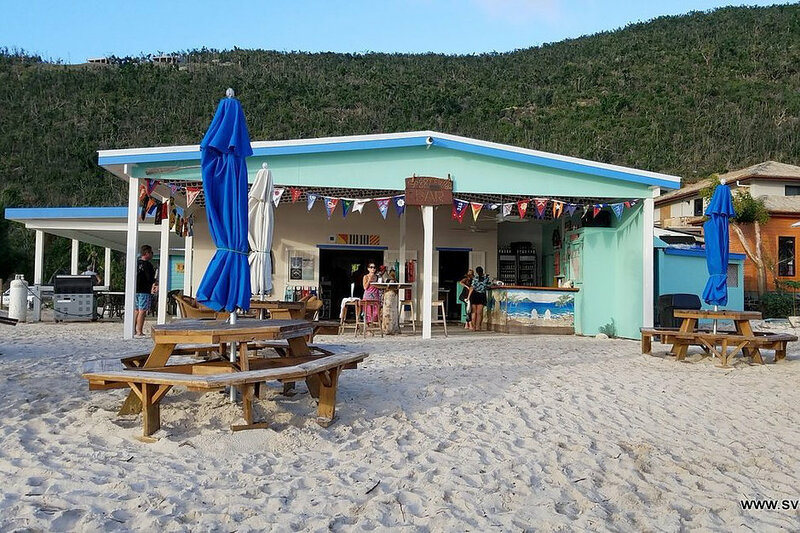 The Soggy Dollar Bar in White’s Bay on Jost Van Dyke is ready, able and willing to welcome all back to paradise. 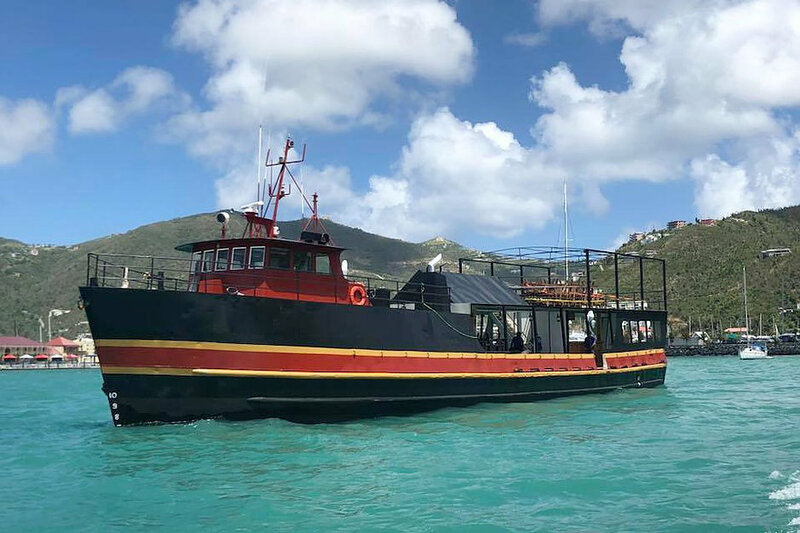 Great News for All Wannabe Pirates & Fans of the Willy T… The William Thornton Has Found a New Home at Peter Island! 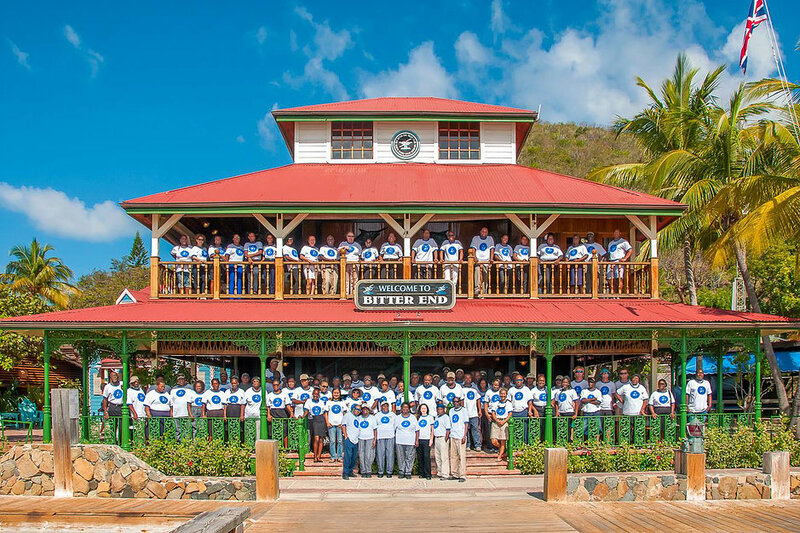 Pusser’s in the BVI’s is known for great pub’s, and great clothing and gifts at their gift shops. 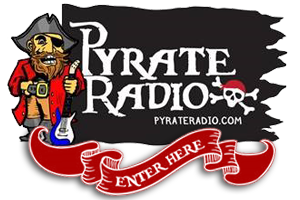 All of the stores will be open for business on or before November 15th. Road Town Pub & Co. Store: Pub open and totally restored. First floor store open and good. Upstairs store, and all of building, will be completely back to normal by end of July. West End: Small restaurant area open upstairs. Store still closed because all of decks and docks are gone, and I doubt they’ll have them repaired before November. 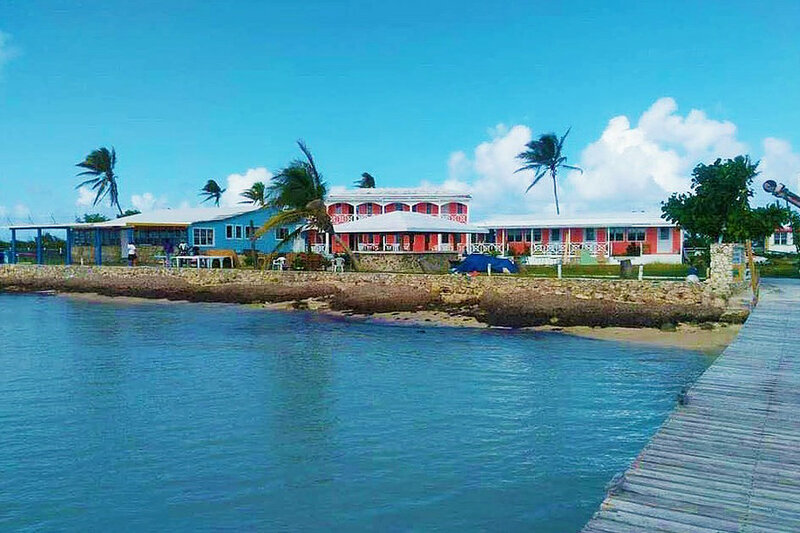 Marina Cay: Currently open for lunch and dinner, and store open at Robb White House on top of the hill. All of our new dock is in. We’ll be ready to pump fuel before mid-July. 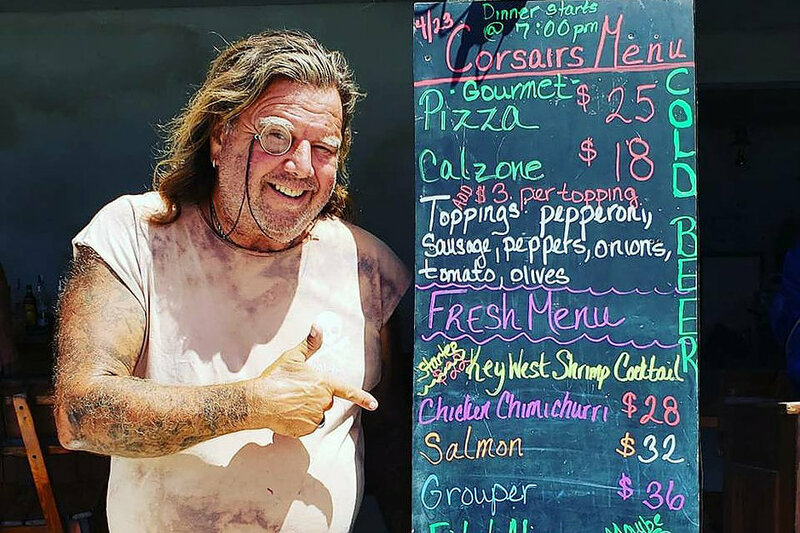 Restaurant and new store open before November. Leverick Bay Store: Fully open now. Surfsong is a boutique resort blending the privacy of a villa with the convenience of a resort including fine dining, concierge services and a beautiful beach. Choose from seven extraordinary one, two or three bedroom villas or reserve the entire resort for your group of up to 30 guests. 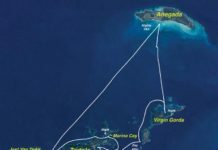 Stretching across five acres of waterfront property along the south shore of Beef Island, British Virgin Islands, Surfsong has welcomed guests for more than 10 years. The essence of relaxation in a pristine, natural oceanfront setting with a tranquil swimming beach, this intimate resort resonates with warmth in every detail. Each of the seven villa offers individual distinctions and luxuries that include secluded decks, waterfront views, intimate courtyards, elegant furnishings and unique design touches. Renowned for quality service, the Surfsong team is devoted to the enjoyment of guests. On-site amenities include spa services, The Courtyard at Surfsong’s fine dining experience, and many romantic on-site destinations, beach chairs and water sports; guests can choose island adventures from deep-sea or bone fishing to zip-lining, hiking, snorkeling, diving, sailing and much more. 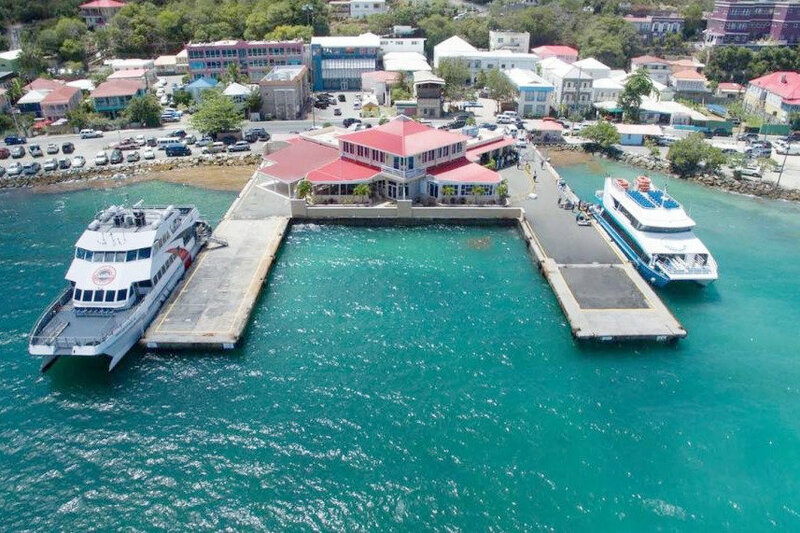 Great News for BVI Visitors… Road Town Ferry Dock Reopens! Cane Garden Bay and Brewers Bay to Get $1.7 Million Makeover! Although the Sugar Mill Hotel was not as badly damaged as other places, the infrastructure of Tortola has been impacted by the two hurricanes. Repairs are being made but docks, ports and roads etc will not be ready for visitors for many months. So like many of the other high end resorts, they have made the decision to remain closed until October, 2018 in both the restaurant and the hotel. Get Down and Get Funky at De Loose Mongoose on Trellis Bay! 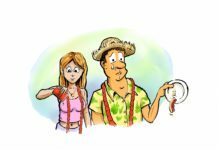 For all of those who love Trellis Bay, I just saw that De Loose Mongoose is in the progress of rebuilding its restaurant and Beef Island Guesthouse with plans to open in late Spring 2018. 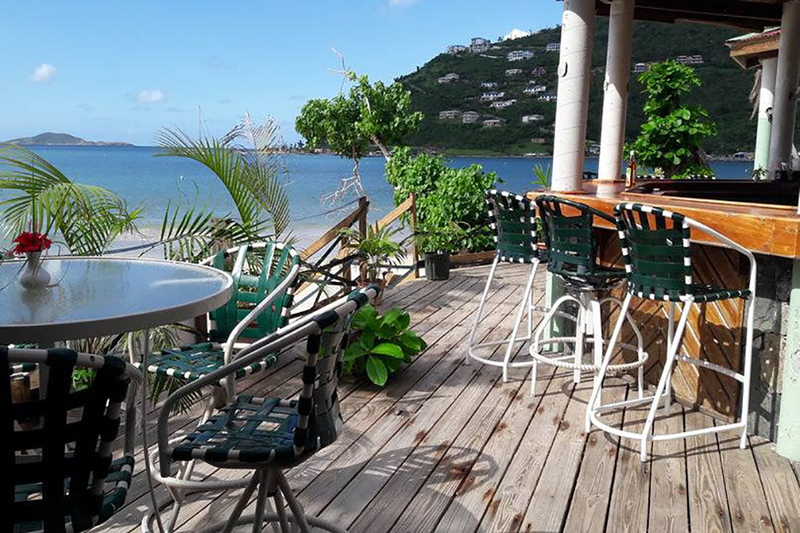 De Loose Mongoose is a funky beach bar, restaurant and guesthouse nestled on the south-east corner of Trellis Bay. 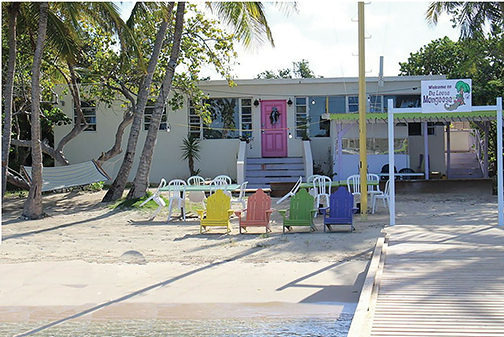 Situated right on the beach, it is great place to enjoy breakfast, lunch or dinner. Their culinary team is lead by award winning chef and owner Mr. Neil Cline. 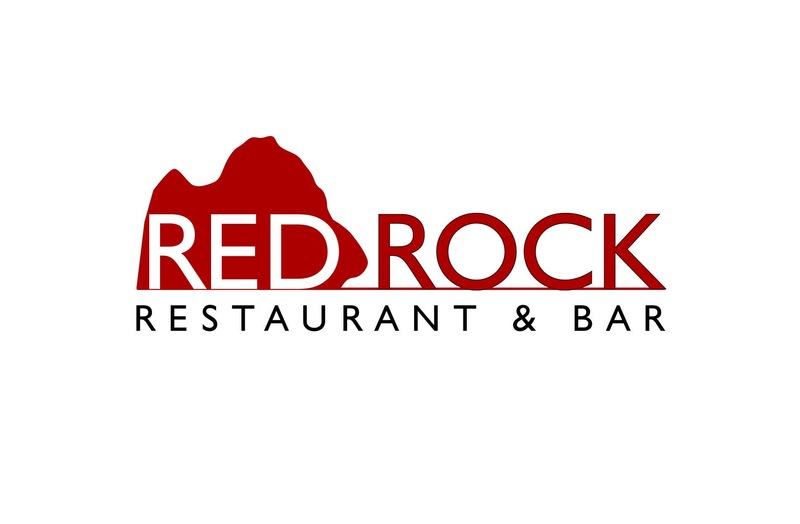 They offer a mixture of Caribbean infused cuisine, great drinks and even live music on certain nights. So come on out, get down, get funky and enjoy a great island vibe at De Loose Mongoose! Get a Luxurious, Old-World Mediterranean Feel at Scottland Villa Above Smuggler’s Cove! 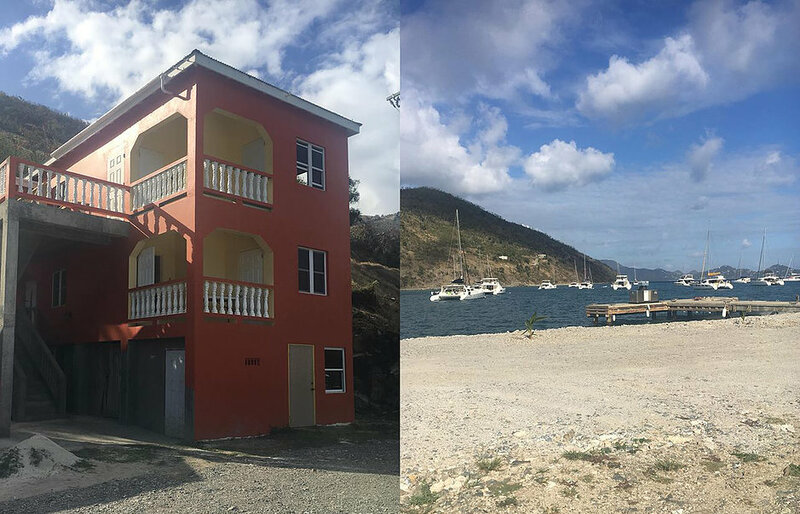 Samantha Pierce, at Villas of Tortola, has advised that Scottland Villa in Smuggler’s Cove is again available for vacation rentals. Nestled discretely in the lush hillside of Tortola’s Northwestern coast, surrounded by banana, lime and coconut trees, overlooking the white sand of Smuggler’s Cove – Scottland House truly harmonizes Mediterranean style with Caribbean flare. This gorgeous two-story, two-bedroom masterpiece showcases natural wood wherever possible – giving this quaint, yet luxurious villa, an old-world Mediterranean feel, right here in the Caribbean. Lower-level accommodations include a comfortable living room, decorated with local prints and artifacts. This welcoming area lets in plenty of natural light, as it opens fully to the patio, private pool, and magnificent views. Take advantage of this substantial outdoor space by relaxing poolside, firing up the built-in BBQ, and dining on the heavy wooden circular table. Pool measurements (25′ x 8’9″ x 4’8′ deep). Scottland House is home to a well-equipped country kitchen, adjacent to the living room, through a wide open doorway. The second bedroom, located downstairs, offers a queen bed and half-bath, and is accessed by a short flight of steps from the rear of the kitchen. This bedroom has AC and its shower is outdoors. Upstairs awaits a romantic master bedroom suite, with vaulted ceilings and a king size four-poster bed. 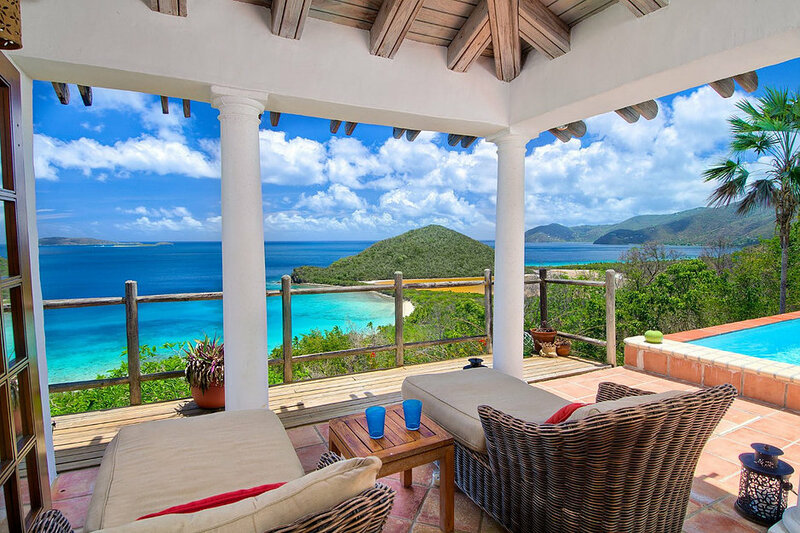 French doors open wide to a small balcony, exposing views of nearby Islands like Jost Van Dyke, Sandy Cay and several others. This room includes a walk-in closet and an en-suite bathroom, where a refreshing rinse in the natural stone shower is the perfect beginning or end to any day. The Master Suite has AC and a SmartTV. Somewhat hidden behind the master suite, is a private tiled courtyard with table and chairs, and a garden path to a pavilion-style gazebo with a perfectly swaying double hammock. 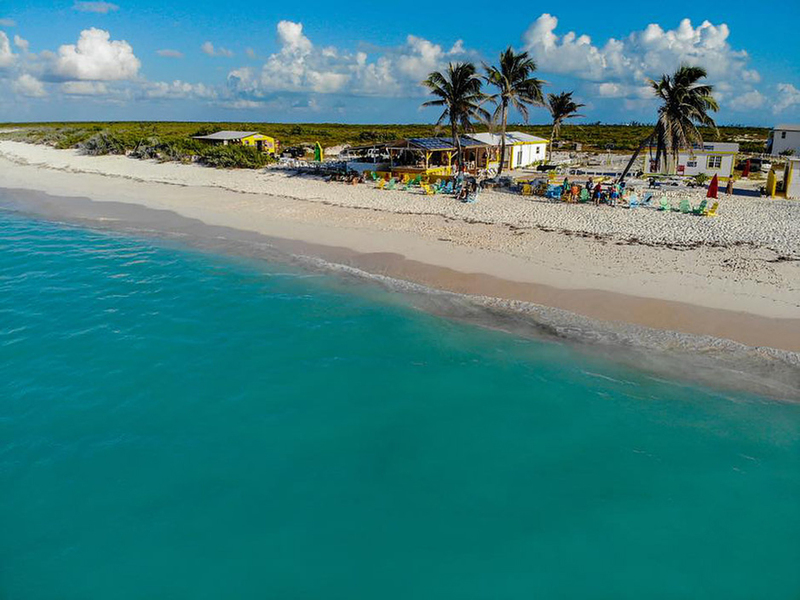 A 15-minute walk (or quick drive) brings you to Smuggler’s Cove, where you can read on the beach, enjoy snorkeling the crystal clear Caribbean waters, or even imbibe, as friendly locals are sure to be serving cold beverages and hot food. 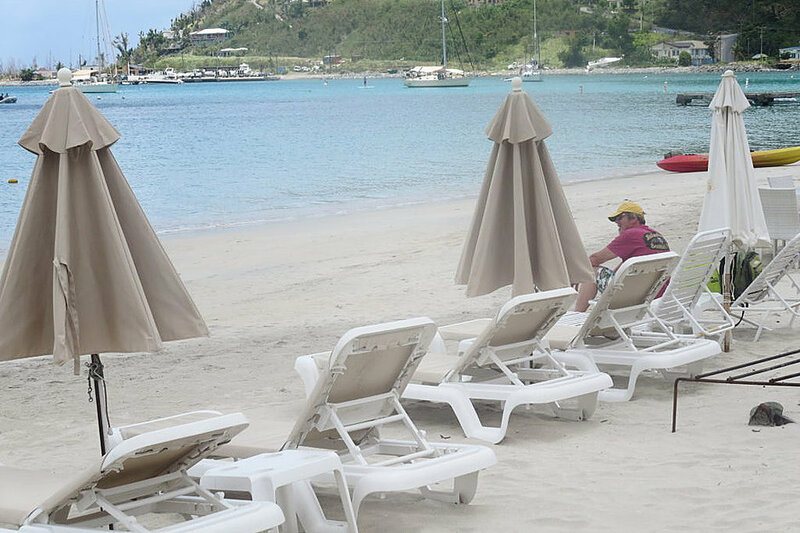 Your neighbor to the East, Long Bay, offers a mile of white, sandy beach in a beautiful resort community as well. With a quiet, romantic aura, Scottland House is an elegant and relaxing escape for honeymooners or for couples with their children. Turtle Bay House Offers Unparalleled Beauty and Exceptional Privacy! 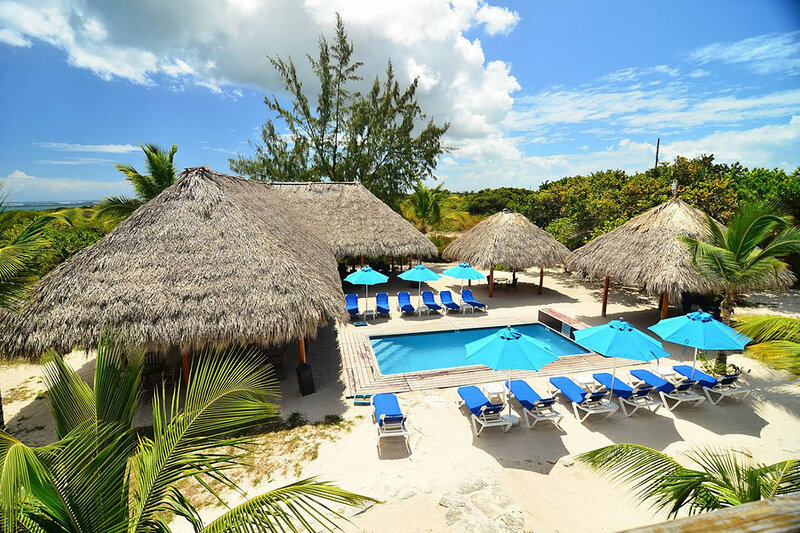 Turtle Bay House offers the perfect balance of sophistication and relaxed comfort. 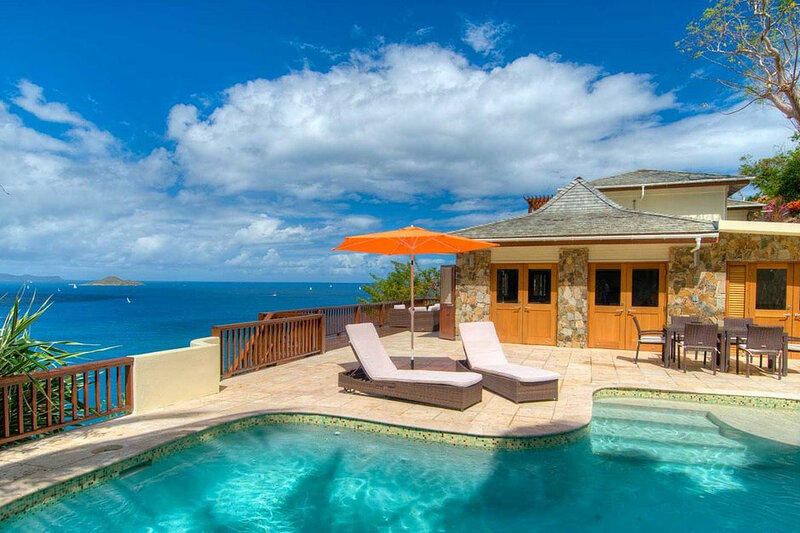 This villa is located in Nail Bay Resort on Virgin Gorda. One of the best features of the home is the beautiful quiet beach accessible by a path below the home. 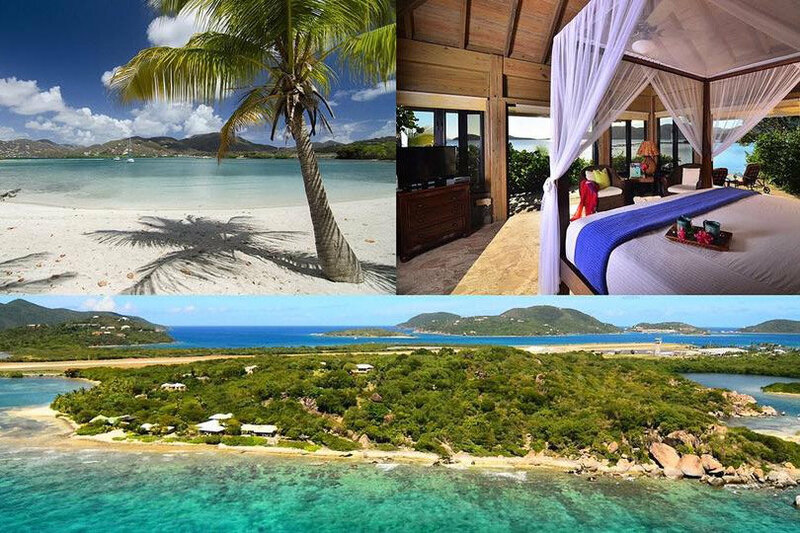 Whilst it’s difficult to have a bad view in the BVI, the views from this exceptional property are truly outstanding. Turtle Bay House has recently been renovated to the highest of standards with travertine tile, granite, stainless steel hardware of the highest quality, and custom mahogany millwork, doors and windows throughout. Spacious shady terraces from each bedroom and around the pool and lounge area are just perfect for lying back, pina colada in hand, and enjoying the ocean, island and sunset vistas that seem to go on forever. 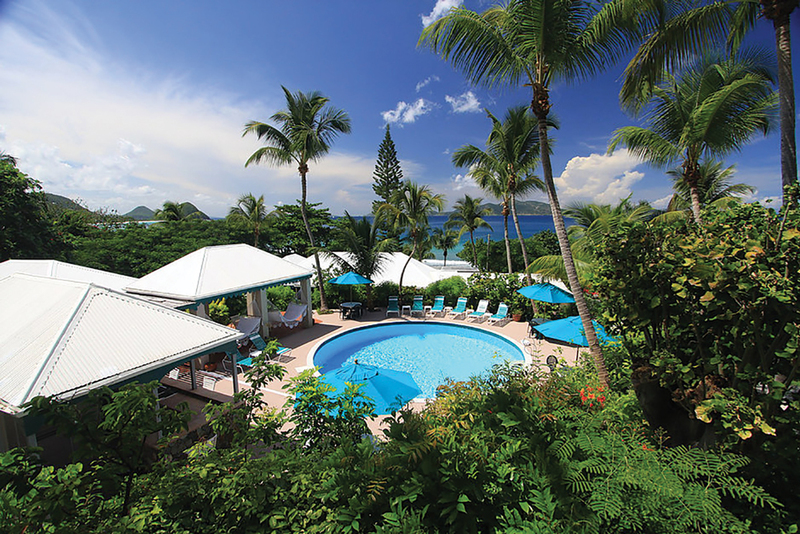 Situated above Mountain Trunk Bay amidst beautiful tropical gardens, this lovely house offers a king suite, queen suite, double suite and a suite with two twin beds. All suites feature en-suite bathrooms. 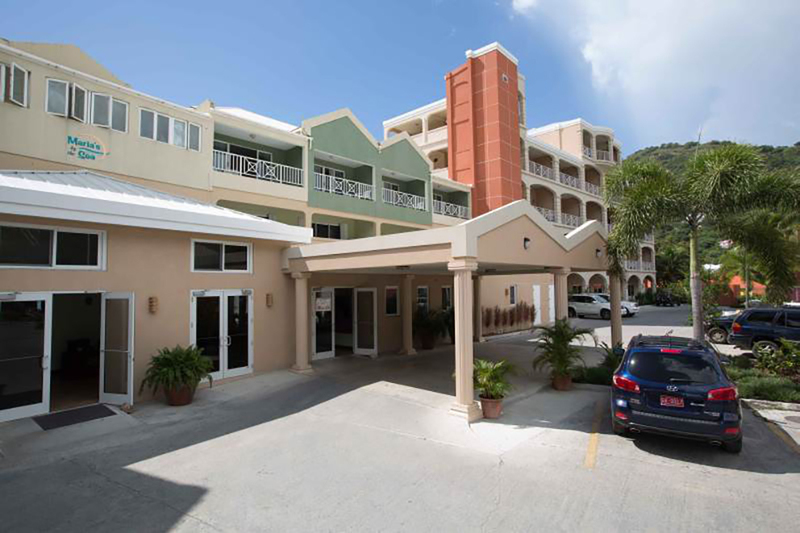 All rooms open onto spacious patios with breathtaking views down Sir Francis Drake Channel and the islands surrounding Virgin Gorda. The Great Room is a wonderful place to relax, unwind and enjoy the magnificent views. The unparalleled beauty and exceptional privacy of this home will ensure that your stay at Turtle Bay Villa will truly be an unforgettable experience! Leverick Bay is located in the North Sound of Virgin Gorda, BVI. We took a direct hit with Hurricane Irma and suffered extensive damage. We lost roofs, outbuildings such as the beach bar, stages and retail shops. In addition, debris & water filled the entire property. We were very fortunate to begin the clean up and rebuild literally days after. Our staff was absolutely amazing and found their way over the roads to assist with the clean up of debris around the resort – they were willing to do anything to help. 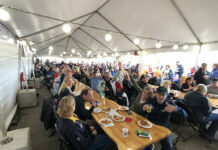 We had construction crews start immediately and were able to rebuild completely and open for the season ahead of time. Of course there were many challenges such as communication, power, water, diesel, etc., etc. 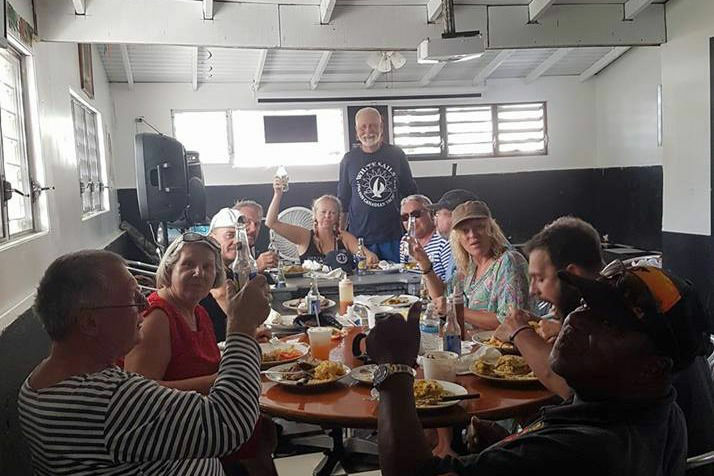 We were able to keep pushing through all of these and I can’t tell you how amazing it was to see the first Charter Boats arrive in our Marina, as well as welcome our land guests & locals for a meal on the Beach. Leverick Bay Resort & Marina is fully OPEN. 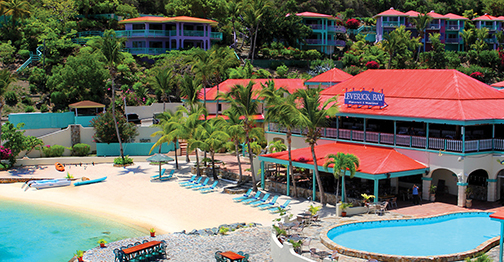 We have a wonderful fine dining restaurant, a casual cove area & beach bar all open for business. 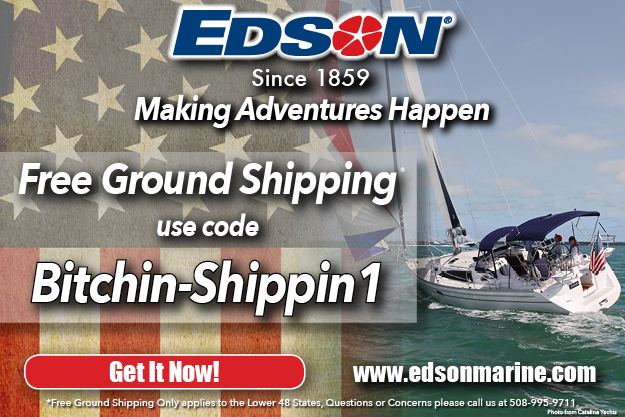 In addition, the Marina is open with both mooring balls & dock slips. The dock has water, power, ice & fuel. We also have a grocery store for all your provisioning needs, hotel accommodations, a pool, spa, hot showers, retail shops, water sports, entertainment and more! We are a full service stop with amazing views, friendly staff & endless amenities. 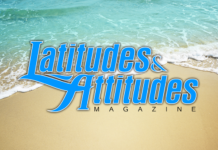 Located in Penn’s Landing Marina, Tortola. First rum is on them! Your post is really good and full of useful tips. I like your post. Thanks for sharing with us. The biggest danger of the Internet in your generation is that people are keeping themselves from taking advantage of it. drones camera justice must follow a criteria which is really need to save ourselves. Hot rolling of stainless steel angle Perth is the most cost-efficient production method. It is not very costly and complex to hot roll L-profiles. Therefore, it is an economic alternative to achieve commodities.